We often associate women as the primary sufferers of varicose veins, and while they do tend to occur with more frequency in women, men are not out of the woods here. 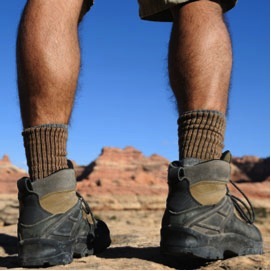 In fact, around 56% of all men will suffer from varicose veins in their lifetime. Yes, varicose veins are a woman’s problem, however, they are yours too men! While they are often unsightly and mostly cause more cosmetic concern, you should be concerned about them in terms of your general overall health. Varicose veins can lead to discoloration at the site, bleeding, skin ulcers, and the “heavy leg” sensation that can hinder your daily activities. Now you are asking, “How does this even happen? !” The problem is your veins in your lower extremities. When you are in an erect position, aka sitting or standing, for long periods of time, your blood pools in those veins, causing the vein walls to expand. Now this is completely normal, except, over time, your veins stop returning to their taught condition- this in turn causes a varicose vein to develop. Men, it is important to move around during the day and not stay erect for long periods of time. It is important to note that your veins are pushing blood all the way back up to your heart from your lower extremities, make it a little easier on them and shake your legs out throughout the day!